The sight of water flowing from taps may soon be a luxury, with people having to queue up at tankers for just a bucket load of water for their daily needs. Meanwhile, affluent neighbourhoods in gated communities may install desalination plants paid for (by volume) by wealthy homeowners. If we are to try and bring some order to this chaotic picture of near future, the starting point for Dr Arif Anwar, who heads the non-profit research organisation International Water Management Institute (IWMI), will be to ensure that cities are water secure. This is because the day-to-day injustice from inadequate water supply hits people with precarious livelihoods the most. In fact, for several years now, the chaotic picture of the future is already a reality in scores of informal settlements in the port city of Karachi. Since they first migrated to the metropolis from their village in Mian Channu, a small town in southern Punjab, and settled in a two-room quarter in Shirin Jinnah Colony, almost a decade ago, Mohammad Riaz, his wife, and their five kids have been rationing water. “Back in the village there was always plenty of water so it came as a shock for all of us that our father had to buy water for us,” says Aasia, second in line among Riaz’s children. She is now married with a year-old son but lives with her parents, along with her husband, while her older sister Rashda lives in the quarter next to her father’s with her husband, and two children. All three of Riaz’s daughters and his wife work as maids in the nearby residential area of Clifton, while one son works in a restaurant and the other son with disabilities stays home. “We use a bucket each to bathe while my mother, father, and my sister’s son shower where they work. They also fill their flasks from the homes they work in to save money and after the evening meal, we never wash dirty dishes under running water,” explains Rashda. They use the underground water which is salty to wash their clothes, although the final rinse is done with the tanker water. This is their way of making their tanker water last till the very last drop. For drinking, they buy additional gallons of unbranded filtered water from a nearby shop. “A 25-liter barrel costs PKR 70 and lasts two days in the really hot weather,” she points out. This strict system of rationing water is not peculiar to Riaz’s home. Many families across informal settlements in Karachi, where 60 per cent of the city’s population resides, have come up with their own ways of conserving water. And because so much energy and money is spent on ensuring that they have enough water for the day, it has become increasingly difficult to escape from the poverty spiral. “If we were not spending so much on water, I’d be able to save up enough to build a home for myself,” says Aasia. 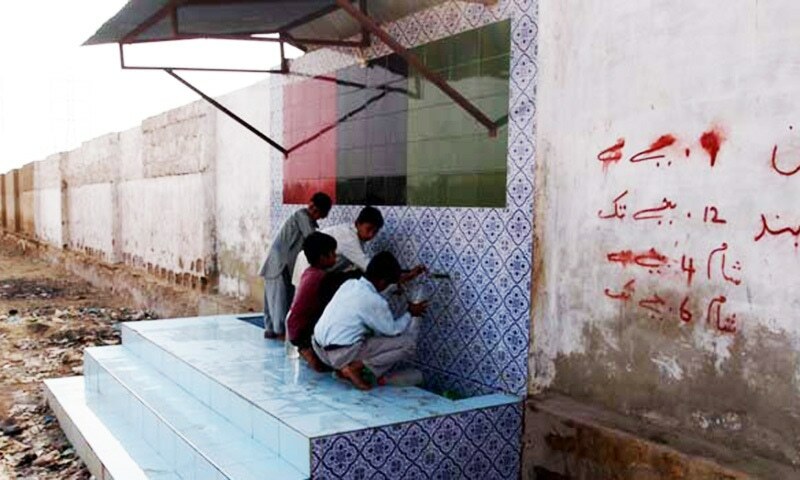 Most Karachiites blame the Karachi Water and Sanitation Board (KWSB), the organisation responsible for production, transmission, and distribution of the city’s potable water, as well as managing the sewerage system, for the disrupted supply. In turn, the board blames the runaway population, and aging and leaky pipelines for which it has no resources to repair, and water thieves for the shortage. The Supreme Court of Pakistan often jumps in by rapping at the government’s knuckles, being public trustee, to do its job of ‘provision of potable water’ but the woes of the people continue. 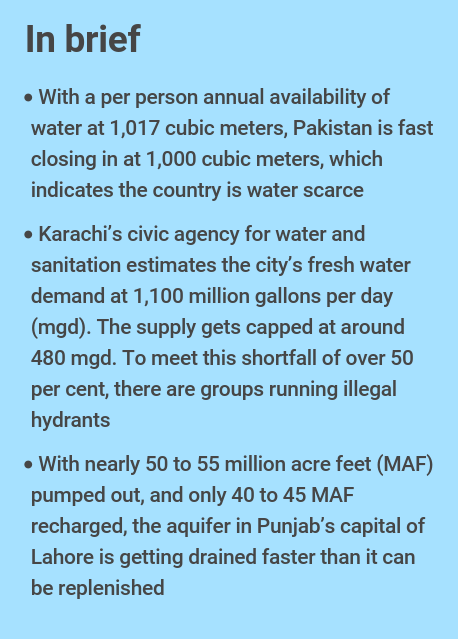 Karachi, according to the KWSB, needs 1,100 million gallons per day (mgd) for its galloping population of 15 million, but it only gets supplied with 450 to 480 mgd. To meet the shortfall of over 50 per cent, there are groups running illegal hydrants which supply water to residents, making huge profits out of this unmet need. The situation is no better in rural Sindh where water often does not reach the land of small farmers at the tail-end of canals for them to be able to cultivate and what does reach them is seawater rendering their arable land unproductive. Those at the head reaches of the canals are often more powerful and enjoy political clout with the result that they are able to exert influence with the irrigation department, flout laws, and divert more water towards their land. There are many who think any talk of water scarcity and what it may portend for our future is nothing but hogwash. They believe that with three snowcapped mountain ranges — the Himalayas, Hindu Kush and Karakoram — surrounding Pakistan, spanning 11,780 square kilometers with 7,259 glaciers (containing 2,066 cubic kilometers of ice), the country’s water source is infinite. It is these glaciers that feed the mighty Indus and its 1.12 million square kilometers basin, 47 per cent of which is in Pakistan and 39 per cent, 8 per cent and 6 per cent in India, China and Afghanistan, respectively. But the signs of water stress are everywhere in Pakistan — in the form of water scarcity, resource depletion, and even contamination. 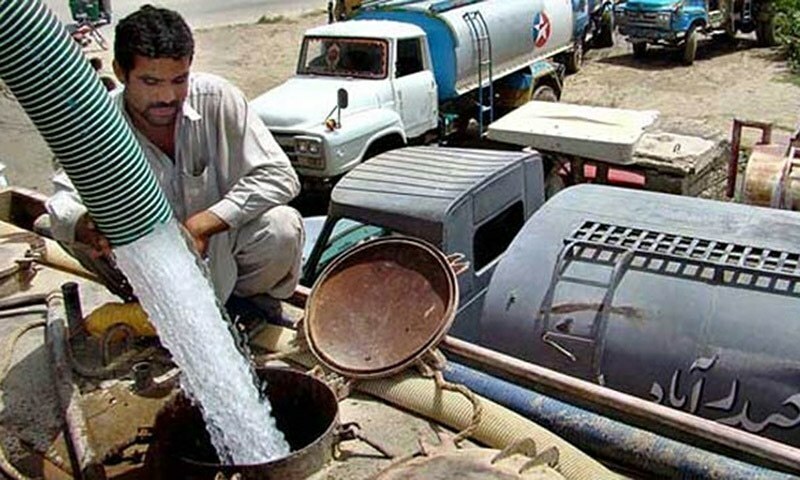 The situation is further compounded by uncertainty introduced by climate change and the prediction by the Pakistan Meteorological Department (PMD) that the country will become water scarce by 2025. With a per person annual availability of water at 1,017 cubic meters, Pakistan is fast closing in at 1,000 cubic meters, which indicates the country is water scarce. Although, the Pakistan Council of Research in Water Resources (PCRWR), a government agency that carries out water research, had asserted that the country crossed the ‘water scarcity line’ way back in 2005 after having crossed the ‘water stress line’ in 1990. “Among water professionals in Pakistan, when we say water is getting scarce, we are typically referring to the Falkenmark Water Stress Indicator – one of the more commonly used measures to calculate the volume of renewable water available per capita,” explains Dr Anwar, adding that the decrease in water availability in Pakistan is because of a rise in population, and not because the volume has decreased. The recent census has put the country’s population at 207.7 million, which will cross the 395 millionth mark, on its 100th anniversary in 2047, if the population continues to run amok at the same rate. With this fast-rising population, the demand for water will increase exponentially. According to a 2015 IMF report, the demand for water is on the rise and is projected to reach 274 million acre-feet (MAF) by 2025, while supply is expected to remain stagnant at 191 MAF, resulting in a demand-supply gap of approximately 83 MAF. In Karachi, what little water is supplied to residents is surface water; while in Lahore groundwater is supplied to the residents. With nearly 50 to 55 million acre feet (MAF) pumped out, and only 40 to 45 MAF recharged, the aquifer is getting drained faster than it can be replenished. A NASA-led study has confirmed this. The researchers studied 37 of the largest aquifers of the world between 2003 and 2013, and found the Indus Basin aquifer the second-most overstressed, and being depleted without getting recharged. It is also on the World Resource Institute’s water stress index. Lahore’s population of over 11 million is supplied with 1.29 MAF daily of groundwater extracted through hand pumps, motor pumps, and tubewells. In 1960, there were about 20,000 tubewells in the Punjab. Today, water experts say there are over a million! According to WWF-Pakistan, the depletion of groundwater in Lahore has reached critical levels with the rate of about 2.5 to 3.0 feet per year. The water table, in the central part of the city, has receded below 130 feet, and in the Gulberg area, it has fallen below 147 feet approximately. It is projected to recede below 230 feet in most areas by 2025 if groundwater is not conserved and the present trend of extraction continues. This is because anyone can install a tubewell of any capacity, at any depth, and extract any amount of water. But this is soon to be changed. In a bid to stem unbridled use of this precious resource and build resilience and adaptation, the provincial government’s Irrigation Department has drafted the ‘Punjab Groundwater Protection, Regulation, and Development Act (2017)’, and is in the process of consulting various stakeholders. Once in place, commercial and industrial enterprises will have to seek permission to extract groundwater. As for regulating and managing municipal water, the Punjab Municipal Water Act was introduced in 2014 but remains unimplemented. The problem isn’t just about the decreasing quantity of groundwater, but also that the resource has been contaminated by industrial and municipal effluent. Last year, a research published in Science Advances analyzing data from nearly 1,200 groundwater samples from across Pakistan stated that up to 60 million people were at risk from the deadly chemical arsenic. The World Health Organisation has established a level of 10 micrograms per liter as the permissible concentration in drinking water, but Pakistan government says that 50 micrograms per liter is acceptable. The study said “very high concentrations, above 200 micrograms/liter, are found mainly in the south” and warned that regular consumption of water containing high concentrations of arsenic may lead to skin disorders, lung cancer, and cardiovascular diseases. Earlier this year, the Punjab government launched a crackdown in all 36 districts and destroyed standing crops on thousands of acres that had been watered with untreated industrial effluent and sewage. In the future, the farmers will only be allowed non-edible crops like bamboos, flowers, and indoor plants. Much of the demand for water is driven by agriculture, points out Dr Khalid Mohtadullah, an expert in water resources policy and senior advisor to the International Center for Integrated Mountain Development (ICIMOD), a regional intergovernmental learning and knowledge sharing center. “About 95 per cent fresh water is utilised for agriculture and still the country is among those with the lowest productivity,” he contends. Despite water intensive irrigation, Pakistan’s per acre yield is quite low. In fact, the Water and Power Development Authority (WAPDA) states that the country has the lowest productivity per unit of water i.e. 0.13kg/m3 in the region, compared to India at 0.39kg/m3 and China at 0.82kg/m3. Looking back, Anwar notes that Pakistan started on a ‘trajectory (from its colonial past) of expanding the irrigated area, but then, over time, when it should have turned to getting more out of the area, it continued to irrigate more and more land’. He gives the example of the newest Kachhi canal project which, he says, is about irrigating yet more land. “The challenge for the state is to achieve savings in agriculture water use to meet the rising water demand in other social and economic sectors,” says Mohtadullah. “But it’s not easy because it will require improved water governance and management and investment in scientific knowledge, all of which will require commitment and resources,” he says. Additionally, says Anwar of IWMI, there are countries that have been able to have a higher gross domestic product (GDP) and better quality of life indicators than Pakistan with less quantity of water, demonstrating that water scarcity measured by the Falkenmark Water Stress Indicator does not necessarily lead to a diminished quality of life. They have been able to do this by moving away from an agricultural economy heavily reliant on irrigation. While there are many such countries in the Middle East, Anwar compares Pakistan to Egypt. “Egypt’s available quota of water per capita has dropped to 663 m3 per year, a decline of more than 60 per cent in 43 years. Yet the GDP per capita of Egypt was $3,685 in 2016, while Pakistan’s was $1,441, and agriculture only contributes 10 per cent to Egypt’s economy,” he says. Israel is bang in the middle of a desert, but by using the right technology, economic resources, and political determination, it has been able to reuse effluent to irrigate about 40 per cent of its land. Maybe we can learn from their Shafdan Wastewater Treatment Facility. Located south of Tel Aviv, it is Israel’s largest wastewater treatment and reuse facility. It supplies approximately 140,000,000 m3 per year of reclaimed water to the Negev Desert in the south of Israel for agricultural use on 50,000 acres of irrigated land. “I believe that beyond the human rights to water and water for domestic consumption, environment, cultural, and municipal uses, all other uses should be billed and paid for, especially in agriculture which uses up to 97 per cent of all surface water and a similar proportion of groundwater,” says Pakistan’s foremost water expert, Simi Kamal. But Anwar disagrees, saying that water has to be metered in cities everywhere ‘irrespective of whether it comes from the municipality or from a private bore hole’. To this, adds Ahmad Rafay Alam, an environment lawyer and activist, “And while considering water charges, agriculture tubewell tariffs need also be reconsidered and revised to be able to cover operation and maintenance of the infrastructure used by the Irrigation Department”. Kamal points out that when everyone who uses water pays for it, the ‘consumption will go down, people will waste less, cropping patterns will change and the market will adjust’. Even history shows, she says, that macroeconomic measures by states and global financial institutions, as well as citizen’s action and behavior at the lowest levels can change economic realities. She is also of the opinion that growing crops like ‘water-heavy sugarcane’ may be discontinued as sugar can be bought more cheaply from the open market. Poor management of existing water resources, compounded by changing precipitation patterns due to global warming and not having invested in storages has made Pakistan all the more susceptible to extreme floods, long spells of drought, and increasing natural disasters. Since 1976, when Pakistan built the Tarbela dam (on the Indus river) no new dam has been constructed. Today, Mangla (located on Jhelum river and constructed between 1961-67) and Tarbela, the two major reservoirs in the Indus basin store only 14 MAF of the 145 MAF that flows through Pakistan annually, and that too only for 30 days. The international standard is 120 days. Anwar, however, says that while more infrastructure was always popular and is probably necessary too, Pakistan should manage the water it has and make the existing infrastructure better. State institutions have limited capacity to manage the water sector, and repeated attempts and investments to fix them have failed. “We have to get much more creative,” he says, favoring involvement of the private sector to manage water. “De-bundling services and allowing non-state sectors to manage it would be a good start to address the institutional issues,” he concludes. This story originally appeared on MIT Tech Review Pakistan and has been reproduced with permission. We have atom bombs and missiles but not water to drink. Save every drop of water. Use rainwater harvesting. I don't know about Pakistan, but in Mumbai its mandatory for new buildings to have some form of rain water harvesting. Control population growth, else you are doomed. All the farmers in my home village are in a competition with each other to dig the deepest wells and to pump the most water out. When I talk to the elders in my village they say the water was once only 30 feet under ground. Now they have to dig wells over a 100 feet deep. Every year the water level falls. Every year the water gets more polluted. Every year the population increases. Everyone knows this cannot continue for ever. Yet the madness continues. The elite have the money so they are insulated from the problems of water. So the problems are not addressed. if only our neighbors to the east come to their senses and release our water to us. @khan. We have to do the following. 1. Reduce our population growth rate. (easily said than done!). 2. Build huge water storage facilities under ground to be used during monsoon and flooding of the rivers, so crops can be saved and water simply does not evaporate. ( very possible and feasible) 3. Farming should be done more scientifically using drip irrigation, and learning from other countries how water can be saved. 4. Urban areas have to make water harvesting mandatory in the building bye-laws. 5. Waste water ( grey-water) should be filtered and re-used for vegetation, Water closet. (W.C.) use. 6. Make use of Solar Photo Voltaic cells to generate electricity and run Reverse Osmosis Plants, to convert sea water into potable water. 7. Cut down on water wastage in the main Pipe lines leakages through out the country. 8. Landscaping should be done sparsely using vegetation which consumes least water. 9. Each citizen has to become more water conscious and save water. Both India and Pakistan need to have far better water management ie spend billions on dams, reservoirs, Desalinization of sea water, drip irrigation and above all stop breeding like rabbits. The biggest problem in India was up till now, no political will and corruption of Congress. The biggest problem in Pakistan is the same except both political will and corruption is 100 times more. @khan your neighbors are giving you more water that you deserve. Pakistan's population will more than double in the next 50 years, and all Pakistan's leaders do is trade verbal attacks. Without unity people cannot solve the water crisis that is certain to come. On top of that, landowners will use their political influence to take the majority of the water for their crops. With over 60 MAF of flood water wasted every year to sea out of the available supply of present 110, it is a criminal apathy of the so called leaders. Once we had 181 MAF of river flows before 1960 when we generously gave India the three Eastern rivers, in return for World Bank brokered Indus Water Treaty with India. But, we failed to follow the Indus Basin Development Plan prepared as aresult due to the internal water war between provinces and now we are nowhere to go. It is definitely our own fault. @khan There you go. Solution to ALL our problems the neighbor to our east. They are always stealing 'our' waters even though fully 40% of the waters we get are allowed to flow into the sea wastefully. Pakistan needs to build check dams on every 10km on Indus. Thankfully Indian scientists have succeeded in extracting fresh water from sea water that too at a cost of 5p per litre. This should help Karachi as well. Simple solution. ...enforce a one child policy and control the population. A negative polution rate will ensure we decrease from the current 207 million figures instead of increasing. Private sector should be allowed to provide water to domestic users. In the past 70 years, our state institute WASA has srriously failed to provide drinking water to the domestic users. I dont think there is a single house in the whole country where drinking water is available 24 hours through WASA. A very informative and useful article which not only applicable to Pakistan but India as well. You dont know how to conserve and use it... half of your fresh water is going to the see due to lack of knowledge for utilizing it before it reaches sea. India continues to flout international law and steals our water by making dams and diverting our water. Eirher Kashmir is liberated and we retain our right on our rivers, or we will have to nuke India's illegal and immoral dams on our water ways. Either way, a water war is imminent. @khan sorry, you only should be your sense. Water supply of Pakistan has not reduce, per person allocation has reduced due to increase of population. In 71, Pakistan's population was less than 50 million, now it is over 200 millions. Your unchecked population growth is the main cause of water scarcity. Build small water storages/reservoirs and replace water intense crops like rice with native crops. Think of small reservoirs at city or town level. Native crops use lot less water.